7 Each one of us has received a special gift in proportion to what Christ has given. 9 Now, what does “He went up” mean? It means that first He came down to the lowest depths of the earth. 10 So the One who came down is the same One who went up, above and beyond the heavens, to fill the whole universe with His presence. 12 He did this to prepare all God’s people for the work of Christian service, in order to build up the body of Christ. 13 And so we shall all come together to that oneness in our faith and in our knowledge of the Son of God; we shall become mature people, reaching to the very height of Christ’s full stature. 14 Then we shall no longer be children, carried by the waves and blown about by every shifting wind of the teaching of deceitful people, who lead others into error by the tricks they invent. 15 Instead, by speaking the truth in a spirit of love, we must grow up in every way to Christ, who is the head. 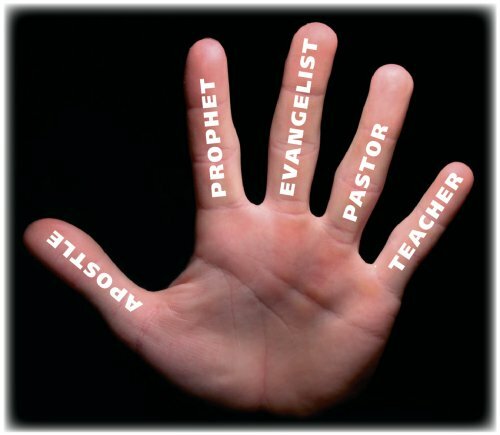 The fivefold ministry is like the five fingers of God that hold the church. “I saw a little cloud like a man’s hand rising from the sea” (1kings 18:44). The Apostle like the thumb can touch and unite all others. The Prophet like the pointer finger points the way. The Evangelist like the longest finger reaches out. The Pastor like the ring finger nurtures Christ’s bride and the Teacher like the pinky gets into the ears the most with doctrines! The fivefold ministry gifts are the ministry of Jesus distributed in the church for her growth. The Lord stood in all of them during His earthly ministry! Jesus was an apostle (Hebrew 3:1), a prophet (John 4:19), an evangelist (Luke 4:18), a pastor (John 10) and a teacher (John 3:2). The fivefold ministry didn’t end with the early church but continues today. They were given to perfect her and she’s not yet perfect! The fivefold ministry is like God’s five fingers holding His bride. “I saw a little cloud like a man’s hand rising from the sea” (1kings 18:44). Using your five fingers; apostles are the thumb, prophets the pointer, evangelists the longest, pastors the ring and teachers the pinky. The Apostle is like the thumb finger that can hold all the rest together and touch each of them, apostles are pioneering servants and overseers. The Prophet is the next finger to the thumb which is known for pointing direction, prophets works close with apostles, and they point the way. The Evangelist is the third finger which is the longest and always reaching out more than the rests, his heart is out where sinners are! So zealous! The Pastor is the ring finger, the custodian of Christ’s bride who must gently nurture her to maturity, feeding the sheep in love and of a compassionate heart. The Teacher is the pinky or smallest finger which gets into the ears the most to incline the doctrine of the Lord and stabilize the heart. Ministry is service. God’s gifts and calling aren’t given to the most important or superior of saints but unto servants and for service! The fivefold ministry is given for the perfecting of the saints, which means the saints aren’t yet perfect but are growing! (Eph. 4:12). The fivefold ministry is like our different subject teachers preparing us for the final exam, all of them are of equal importance! The fivefold ministry was given to prepare us for ministry works, which means they should help each member discover their ministry and function properly! The fivefold ministry is given for the edifying of the body of Christ, the Greek word for ‘edify’ means to build up like an edifice! The fivefold ministry is given to bring us into the unity of faith, not necessarily total agreement in doctrines but oneness of heart! The fivefold ministry is given to bring us into the knowledge of the Son of God, of Christ as God’s Son and of who we are in Him! (Eph. 4:13). The fivefold ministry is given to bring us to a perfect man, the Greek word for perfect means; complete, mature or fully grown! (Eph. 4:13). The fivefold ministry is given to bring us unto the fullness of Christ’s stature, this means we must grow into Him in all things! The fivefold ministry must stabilize our hearts in the truth so that we’re no longer babes, blown about by diverse doctrines! (Eph. 4:14). The fivefold ministry must bring us to the level where we’re able to tell the truth from deception on our own by maturity! (Eph. 4:14). Truth and love are the power twins that must come to the church from the fivefold ministry to make her grow into Christ in all things! Truth spoken without love will most likely do as much damage as lies, it can bring rebellion out of people, it will never edify! Christ is the Head of the Church and the fivefold ministry is given to make the body align fully with the Head, as He is, so are we! Ever seen a white head with a green body? Impossible you will say! Christ is the Head and we His body must be as He is! Every member is knitted together from the Head, increase comes from what each member contributes to edify the whole body! (Eph. 4:16). The church isn’t one person’s building, the pastor can’t make the church alone, it takes the collective efforts of every member! There are those called into the HELP ministry to support the fivefold ones, this includes intercessors, ushers, choirs and etc. (1Cor. 12:28). Imagine a church without choirs, ushers, technical crews, follow up team, security and etc, all these ministers put the church in order! The usher may get more reward than the pastor in the end if the usher is more faithful, God pays by faithfulness and not by titles! The seating arrangement in heaven will be different from what we see in our churches, it won’t be by tittles but by faithfulness! Many answer titles without functions but functions are much better even if they come with no titles, just edify with your ability! It doesn’t matter what we’re called, it matters what we do, eternal rewards isn’t by titles but according to our works! (Rev. 22:12). We don’t labor for eternal life, it’s God’s free gift, we labor for eternal rewards that shall be according to our works! (Rev. 22:12). Ministers shouldn’t birth division but growth, we shouldn’t love one and reject the other if both preach the same Christ! (1Cor. 1:12-13). Christ isn’t divided, His ministers shouldn’t be, if we’re divided, the enemy will have easy way among us and afflict the flock! We can be more or less anointed in our various offices but that shouldn’t birth pride, the gifts of God must work with His humility! Whatever gets the cloak of humility off a minister is deadly enough to send him to an early grave, so, keep yourself in love and meekness! Paul may plant and Apollos waters but what brings the increase is of God, we must recognize this fact and give Him the glory! (1Cor. 3:6-7). You see, the gifts of God are good and perfect and as such can’t corrupt us but we can corrupt them through failure to walk in love! (Jam. 1:17). Sin is the strongest in the realm of evil, it took the best of angels and made him the worst of demons, keep yourself in the love of God! Satan corrupted the anointing when he began to use it to serve himself instead of God and other angels, selfishness corrupts quickly! Don’t let your anointing become your deception, don’t use it to subject and enslave people to your will but use it to serve in genuine love! If our heart isn’t right, no matter how anointed we may be, our work will burn, it won’t withstand the burning love-scale of God! The greatest in the world is he that is served by all but the greatest in the Kingdom is he that serves all (Luke 22:24-25). The gifts and calling of God aren’t exalted positions for taking advantage of people but privileges to be an advantage to them in love! God embedded His selflessness in His gifts, a teacher can’t teach himself, an evangelist can’t evangelize himself and so on and so forth! Our gifts are naturally selfless, they’re things we can do for others, God programmed it that way and reversing it is disastrous! If all your body were eyes, how will you walk? And if they’re all legs how will you see? Which part of you is useless? All gifts are unique! Loyalty and rebellion are like two sides of a coin, our attitude determines the one we get, the minister should be respectful and humble! Love is a universal language, even the blind can read it and the deaf understands it! If we preach the same Christ, then mere doctrinal differences shouldn’t tear us apart, Christ isn’t of division but of peace! Criticism is the worst way to express concern, if you’re really concerned, you won’t be tearing him down but lifting him up in prayers! God’s seed in us is stronger than sin and death, the Christian is free indeed! Redemption is a child of compassion! Destruction is a child of condemnation! Everything we do should be redemptive and not destructive! We’re called to reconcile people to God and not to chase them to hell! (2Cor. 5:17-21). Thank you and God bless you and all yours for these words from God! A word fitly spoken is like apples of gold in pictures of silver. Pro. 25:11.